Walking into the office at 1st Church Unity, in Nashville, I was approached by two delightful women who rushed to me asking “Are you the lady doing the article on tattooing?” Rather than being shy about their tattoos both proudly showed me their beautiful designs. One of the ladies announced she was eighty four, and sported two tattoos (a heart on her wrist and a delicate dragonfly on her ankle) and the other woman had the initial “A” surrounded with beautiful angel wings. Both women graciously shared with me their special reasons for getting their tattoos: one signified a sacred rite of passage after a divorce, another an achievement of a new level of spirituality, and the “A” symbolized love for a daughter who is now fighting cancer. These are typical reasons for various people to have tattoos placed on their body. The images engraved on their skins are not merely designs, but are symbolic images and vibrational changes engraved in their lives and spiritual selves. Larry next described the rich history of tattooing to me. Man’s fascination with tattooing is in fact an ancient tribal practice. The mummy known as “the Iceman” had markings on it which probably would have indicated status symbols or were tribal symbols. Since most tattooists in former times came from Asia and Polynesia, having a tattoo was a sign of wealth and indicated social status. A question that occurs throughout this study of tattooing is what is it about marking one’s body with images that is so important to mankind? In different cultures, tattooing has varied meanings. In New Zealand and Borneo, if you had a tattoo on your face, called a Mocha Mask, this would indicate an elder of a tribe and depicted high stature. It is very honoring of one’s life to have these marks. Polynesian tattoos also show status, and are known as the tribal style (black band) seen on legs and arms in bands. To become a true man one would have to withstand the pain of the tattoo to achieve this status. Also each image within the band of the design had a special meaning to the individual’s life and spiritual direction. By being so marked, the individual’s life was altered by the way the person thought about themselves, and by the way they were treated (respectfully) in society. For centuries, sailors were instrumental in making tattooing popular around the world. 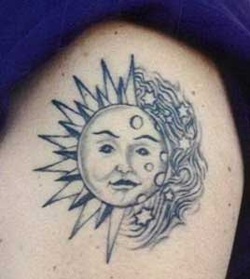 Sailors would often get images like star tattoos, to encourage good luck for their trip home. In recent history, even obtaining a gang tattoo enabled individuals to be accepted within certain communities. “A surprising number of people request designs of specific spiritual images such as crosses, Jesus portraits and other symbols as it pertains to their own spirituality. “ A tattoo often honors an important crossroad in ones’ life. Many people get tattoos to commemorate an event, or person in memory of, divorce, it’s a way of processing important and intense emotions. It’s a personal stamp on your body. And most people that get a tattoo keep them.” Portrait tattooing is another popular way of honoring a loved one or beloved pet. Because of the complexity of this type of artistry, many tattoo artists do not offer this type of service, but Larry specializes in this. Larry also spoke about using specific words in tattoos – as many as thirty percent of the tattoos he does have some type of lettering, mostly names of children or parents. “I try to discourage the use of other individual names as a permanent placement on the body and encourage the use of a symbol as representative of this love instead.” Larry next told me that tattoos can cover or disguise burn marks and surgery scars. When tattoos are placed covering scar tissue, they can be spiritually cleansing for the client. Such tattooing can be very important in healing from the trauma that is left from scars on the body. This type of tattooing literally can change people’s lives by enabling them to feel good about themselves, enabling them to look at themselves once again without emotional pain. Scott Gubala, Office Manager of 1st Church Unity in Nashville, shared with me how his tattoos have helped to reinforce new levels of growth for himself. Scott’s seven tattoos are all images of the earth, sea or air. For Scott, the feeling that it is just time for a new tattoo descends into his awareness. He then allows for this awareness to “percolate” for the correct symbol and location of the tattoo to develop. Location of the tattoo is important to him also, because he wants the images to fit in with the overall scheme of his other tattoos. Next Scott designs the tattoo himself – he is also a visual artist. Designing the tattoo allows him to have more control over the final tattoo that appears on his body. The visual of the tattoo helps him to record his new level of consciousness, which he marks with his tattoo. Perhaps the art of tattooing is reminiscent of man’s sacred cave drawings. Why were these done? All such drawing whether on a cave wall, canvass or on our body seems to be a sacred act. These vibrational expressions of man appeared even before the written word. The power of the image is very impacting and is its own energy. Seemingly, as we add a tattoo design to our bodies, the design image on the skin becomes the vibration of who we are, have become, or wish to be. Tattooing enables us to add to the vibration that our God given body reflects. Be connected to the energy pattern you are and wish to be. Be mindful of the way you live, the thoughts you think, the experiences you bring to yourself. The tattoo you choose will walk with you through the rest of your life. Chose it well and rejoice in your new vibration and concept of yourself!